Take some time to watch your dog while he snoozes. Does he curl up or sprawl out? Dogs that sleep stretched out prefer a mat or pillow-type bed, while cuddling dogs do well in smaller beds with sides. As you observe your pet sleeping, measure him from nose to tail. Add 12 inches to get the optimum length or diameter for a bed. If your dog is a puppy, you might decide to go with a full-size bed and use pillows or blankets to keep him cozy until he's grown. Orthopedic beds with high-density memory foam are good for senior dogs who may have arthritis or sore joints. If your pet has long hair or thick fur, opt for a cot-style bed or one with a cooling pad. A dirty, smelly bed isn't pleasant for either you or your dog. Choose a bed that's easy to clean, whether you remove the cover or simply throw the whole thing in the washer. Just as with any purchase, you need to be mindful of what you can afford. Look for that sweet spot with a dog bed that fits your budget but is durable enough to last for several years. Today's dog beds come in a wide range of colors and fabrics. Fido's not concerned about those options in the least, so you get free rein on those features! 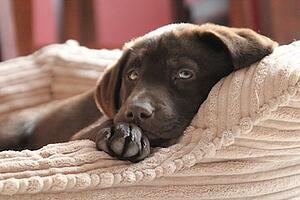 Mats and pads are the simplest types of dog beds. They're ideal for dogs who like to stretch out, and they also can be used with crates. Pillow beds are self-explanatory. They usually resemble couch or seat cushions. Donut or bolster beds have plush bottoms and raised sides. This style is good for dogs who like to curl up or enjoy the security of snuggling next to something. Cot beds come in raised or hammock-style versions. Covered or "cave" beds provide privacy and a touch of luxury. A cave bed can also provide a sense of security for timid dogs. Heating and cooling beds or inserts can give your dog relief during seasonal temperature changes. Travel beds are a great solution if your dog frequently accompanies you on trips. Use these tips to pick out the perfect dog bed so your loyal pup will have a comfy spot to relax after a lively outing at our Springs on-site, off-leash dog park!